45 years since Concorde first flew, a successor does not yet exist. In the intervening years, research and progress to developing a viable civil supersonic aircraft has stagnated. Although there is again a recent upsurge in activity on developing a civil supersonic aircraft, a Supersonic Business Jet, all of the designs in the public domain have serious drawbacks. The first problem is well known and acknowledged; the second one is related to the first; the third one has yet to be widely acknowledged, mainly because the first stumbling block has yet to be overcome. It is now accepted that a next generation supersonic aircraft must be able to fly supersonically overland. This means it must at the very least produce an almost unnoticeable sonic boom. Ideally, it would not produce any boom at all. Our 1999 study into the Market Potential for a Supersonic Business Jet (SSBJ) identified that the overwhelming majority of users would not pay a premium for an aircraft with a relatively small cabin, restricted airfield performance and high operating cost whose superior speed they could only use over the sea. Business aircraft require flexibility or their utility value is severely diminished. While the Sonic Boom is an operational problem, the Wave Drag associated with supersonic flight is the most intractable and serious performance problem. 50% or more of the total drag on a supersonic aircraft is due to wave drag - the drag created by the sonic shock wave. The current approaches to sonic boom minimisation do not seek to eliminate the shock wave, but to shape or flatten the rise time of the N wave signature at ground level so that it is less objectionable. Many of the current approaches to boom reduction actually increase the drag on the aircraft and so reduce range and payload. This is clearly not an ideal solution. The best solution is to eliminate the shock wave and to prevent it from forming in the first place, so that we eliminate both the sonic boom and its associated wave drag. There are a number of approaches to achieving this and information on one system has been in the public domain since 1968. This approach is called Electroaerodynamics. It is already known that shock waves can be eliminated by applying an electrostatic charge to the leading edge of an airfoil. 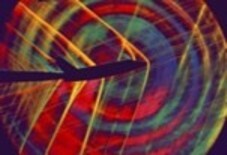 Experiments carried out by Northrop Norair in the late 1960s on a model airfoil immersed in silicone oil, showed that the intensity of the shock wave could be reduced or the shock wave eliminated altogether. The drag on the airfoil was also reduced, the drag reduction increasing exponentailly with applied voltage. This shows that maximum drag reduction of 0.6g was obtained at ~26kV and again at 30kV. Tests were further carried out in a supersonic windtunnel of 1.5 by 3 inch test section using Schlieren photography. In one test at Mach 1.5, an 8 degree double wedge airfoil model 1.5 inches in span and 0.375 inches in chord was used. When a charge of 70kV at 0.01milliamperes was applied to the leading edge, the shock wave disappeared. The power used was 0.7 watts. For a 20 metre span straight wing, this would equate to less than 400W of electrical power. The step changes in drag seen in the graph above above support a quantum energy level or wave harmonic interpretation of the wave drag reduction mechanism. The danger posed by cosmic radiation to future high altitude supersonic operations has not been adequately recognised. The EPA sets a maximum radiation exposure guideline of 5mSv per year. The FAA recommended maximum is 20mSv over 5 years - i.e. a mean of 4mSv per year. Ground level radiation in the USA averages .06µSv per hour or 0.5mSv per year. At 35,000 feet altitude this increases to 4µSv per hour and at 41,000 feet in polar latitudes, the rate rises to 8µSv per hour, or over 100 times ground level radiation in the USA. British Airways' data for 1994 shows that Concorde crews with a 12 month average duty tme of 382 hours received a dose of 4 to 6 mSv, or 10 times the normal background dose of living at ground level. If we say the mean dose was 5mSv in 382 hours from a year flying Concorde, this equates to 13µSv per hour - 200 times the ground level exposure. A typical chest X ray delivers 0.02 to 0.05mSv. This means that flying as a member of a Concorde crew is the equivalent of receiving 100 chest X Rays per year or 2 chest X rays every week. Put in these terms, it is evident that potential exposure to cosmic radiation for future supersonic aircraft crews would be very significant, when compared to what human beings have naturally evolved to live with. Concorde normally cruises at about 50,000 feet. It has been known to descend during flights to reduce the radiation exposure during active solar events. If a large number of future SSBJs were routinely forced to fly below FL500, this would start to bring them into conflict with subsonic traffic. Concorde crews were therefore already receiving the EPA and FAA maximum recommended annual ionising radiation dose from operations at FL500. SSBJ design studies are proposing flight at even higher altitudes up to FL700. According to Dr John Gofman, eminent nuclear physicist and a long term researcher in the field of the biological effects of radiation, 75% of cancer may be caused by the excessive use of X Rays by the medical profession. It is possible that the only reason there have not been widespread cancer problems with Concorde crews is the very limited nature of Concorde operations since 1976 and the rotation of crews through the fleet. This would be very different with a large SSBJ or SST fleet, particularly for the cabin crews who work longer duty hours per year than flight crew. An effective light-weight protection system must be found to protect high altitude SST and SSBJ operations from these high levels of ionising radiation. Gulfstream have presented some preliminary sketches of their "QSJ" (Quiet Supersonic Jet) design. Gulfstream recently patented a boom reduction accessory. One way to reduce the boom is to lengthen the aircraft. This leads to a long and narrow aircraft which is not practical. Gulfstream therefore propose to use a telescopic boom on the front of their SSBJ to increase the effective length of the aircraft during supersonic flight and so reduce the boom. This is a fairly obvious idea and not particularly difficult to conceive. It is similar in concept to the variable pitch spike device patented by John Morgenstern (US 5,740,984) of Lockheed in the late 1990s. In order to improve field performance and reduce approach speed without the need for a Concorde type droop nose and high angle of attack approach, Gulfstream have also proposed to use a swing wing, like some military aircraft. This type of system has never been used on a civil aircraft and would add complexity, weight and cost. A better system would be to use flap blowing or Circulation Control Wing technology as used on the TSR2 supersonic bomber and ground attack aircraft. The aircraft carrier based Buccaneer used a similar less advanced system. The TSR2 weighed about 90,000lbs, so it is in the same weight category as an SSBJ. It had a wingspan of only 37 feet to reduce gust sensitivity during low level supersonic flight. This constraint would not exist for an SSBJ so a wider wingspan and larger wing area would be used. The TSR2 used flap blowing to reduce the approach speed to only 130 knots - which is in the same order as most subsonic commercial transports today. Cross feed was used to maintain flap blowing in the event of an engine failure on approach. With a 1400 square feet wing area for a 90,000lb SSBJ instead of the 700 square feet of the TSR2, flap blowng could potentially reduce approach speed to well under 100 knots. The complex mechanics and weight of swing wing would be replaced with fixed pneumatics giving much higher field performance. Any possible higher fuel consumption for the approach and landing phase would be more than offset by the improved field performance which is a vital factor for the flexible use and utility of business aircraft. The Reno Aeronautical ASSET design of Richard Tracy, now incorporated into Aerion, is based on achieving natural laminar flow over the entire wing chord to reduce drag during supersonic flight. The basic wing cofiguration was originally very similar to the Douglas X3 experimental aircaft or the Lockheed F-104 Starfighter. The latest version of the wing planform now uses rounded wing tips. This planform is very similar to the Kline Fogleman supersonic wing disclosed in US Patents 3,706,430 and 4,046,338. This wing design has an interesting underside modification that it is claimed allows it to reach a 30 to 40 degree angle of attack before stalling. The modification is a spanwise step, similar in concept to a leading edge cuff or a Coanda type step. It increases underside air pressure and hence lift. (We do not know if Aerion intend to incorporate this feature on their design). However, if the Aerion design is not capable of unrestricted overland supersonic flight, it will not achieve market acceptability. SAI's concept was designed for them by Lockheed Martin. It is intended to be a low boom design capable of overland supersonic flight. The principles are to be found in PCT WO 01/58754 and WO 02/46038. The first patent covers Lockheed's "slotted edge" concept to reduce the high drag normally associated with the blunt leading edge (ABLE) approach to boom reduction. Lockheed claim this will reduce the drag associated with normal blunt edges by 40%. The second patent is for the complete aircraft design that we see presented by SAI. This incorporates the underfuselage "whale snout" which Northrop Grumman used to successfully reduce the boom signature of a modified F5 in August 2003. Lockheed filed their patent application in December 2001. The Lockheed design may also incorporate a gull wing. This use of an outer anhedral section is also similar to the TSR2, to increase lateral stability. However, the most arresting characteristic of this design is its weight. With a MTOW of 65,000 kg to 69,000 kg, i.e. in the region of 150,000lbs, the design is 50% or more heavier than conventional SSBJ designs without boom reduction. According to Flght International's report (12-18 October 2004, P34), a 2003 study by Raytheon found that a 6 passenger small SSBJ would weigh 46,000kg and be 41m long for a conventional version or 54,000 kg and 50.4m long for a low boom version. This is paradoxical and in our opinion shows that these current approaches to boom reduction are not going to be workable. It is a similar situation to the so called "low boom - high drag" paradox of using blunted leading surfaces to reduce boom. The sonic boom overpressure of an aircraft is proportional to its weight. The boom is inversely proportional to the length of the aircraft raised to the power 3/2. Therefore in the Raytheon study, although the low boom design weighed more than the conventional one, its length was increased to more than compensate and so reduce the boom to a low level. The Lockheed Martin/SAI design is even more strange in that it has the same length as the Aerion and Gulfstream concepts (40 metres) but its empty weight is nearly twice as much. The tail braced wing, with an area 75% greater than the Aerion or Dassault designs, cannot account for all of this weight increase. This is either being reported incorrectly or an extremely inefficient approach is being taken to minimise the boom. The doubling in weight of the Lockheed Martin design will double the boom pressure, all other things being equal. The Skunk Worlks concept is therefore extremely inefficient if it has to double the inherent boom with boom reduction measures that then have to compensate for their own weight as well as the basic aircraft. This is simply unworkable, inelegant and shows a brute force approach to the problem. Cessna apparently have an SSBJ design based on the cabin of the Citation X. With current technology, the difficulties involved in achieving useful performance diminish exponentially - and vice versa - as cabin size decreases. However, at 34,000 kg (75,000 lbs) MTOW it is still a large aircraft. The Sukhoi S21 design was orignally intended to be developed with Gulfstream in the early 1990s. It bears a resemblance to the advanced Sukhoi fighter designs but is not optimised for boom reduction. Without a western partner, the aircraft would have no chance of success in the North American market. The Dassault design has not been publicly promoted since 2000 and officially Dassault are engaged in further research as part of the European Union HISAC program. Its main drawback is its inability to fly supersonic overland. The table below summarises the specifications that have been published on the various SSBJ concepts. It is our opinion that all of these designs have serious shortcomings. If the current approach to boom reduction is so counter productive, in greatly increasing the weight of the aircraft, it becomes effectively impractical and too expensive. It is clear that current aeronautical science does not know how to solve the supersonic problem. At each stage, the constraints militate against it. The boom and wave drag create enormous drag - so range is limited and large amounts of fuel have to be carried. This increases weight, compromising range again and increasing the boom. The aircraft is lengthened to reduce the boom or other complex features added - which seem to be producing inordinate weight increases in their own right and are therefore counter productive. The question of Cosmic Radiation protection has not even begun to be publicly addressed. We believe that a completely different approach is required, using the Wave Modelling approach and the Electrostatic Theory of Aerodynamics to design a vehicle not for boom reduction but to prevent the boom from forming in the first place. The real solution we need to work towards is to completely eliminate the boom and wave drag - without adding weight. Then we can produce a reasonably sized vehicle with realistically acceptable characteristics and performance. 1. The Market Potential for the Supersonic Business Jet, Market Study, 1999, Meridian International Research. 3. "Living with Radiation", D. Carlisle, Business & Commercial Aviation, September 2001. 4. "Recent Experiments in Supersonic Regime with Electrostatic Charges", MS Cahn, GM Andrew, WE Anderson, Northrop Corp, AIAA 70-759. 5. "Electroaerodynamics in Supersonic Flow", MS Cahn, GM Andrew, Northrop Corp, AIAA 68-24. 7. "Experiments Indicate Electric Charge Could Quiet Sonic Boom", Product Engineering Magazine, 11/3/68 P35-36. 8. "Method and Apparatus for Reducing Shock Waves and Aerodynamic Drag", US Patent 3,446,464, WA Donald, 1969. 9. "Ion Doping Apparatus and Method for Aerodynamic Flow Control", US 6,247,671, Accurate Automation Corp, 2001.